Anti Fatigue / Anti Static! Conductive flooring runner. Interlocking sections, build to ANY Length! Give your employees the comfort they deserve. Give your electronics the static control PROTECTION it demands! Give your employees the comfort they deserve. Give your product the static control PROTECTION it demands! THIS conductive interlocking anti-fatigue static control floor mat provides employee comfort! After all, a more comfortable technician is a more productive Technician! ElectraStat 180 is a static conductive (not merely antistatic) material for ULTIMATE static decay and ULTIMATE static control. Type 180 features end pieces and center sections that interlock for a runner of ANY length. Type 180 is provided with a diamond plate vinyl top surface over a shock absorbing air cell underside. ElectraStat 180 is designed to eliminate static generation from standing technicians and easily meets the stringent new S 20.20 standards with electrical resistance properties of<3.5E07 per 97.1 and resistance to ground of < 1 meg (1.0E06). For covering thin pile carpet and hard surfaces! Easy to ground (requires PN 115 ground cord kit). A full 1/2 inch thick! Static control properties COMPLINAT to new ANSI ESD S20.20 standards! Electrical resistance: <1.0E06 - Compliant with ANSI / ESD S 20.20 - 2007 (the latest US Standards). Meets new ANSI ESD S 20.20 standards with 97.1 test results (combination resistance of technician in heel grounders with ESD floor mat) of <3.5E07. Click Here For Our Full Data Sheet! WHY USE A STATIC CONTROL FLOOR MAT? Static electricity can wreak havoc on electronic components as well as cause issues in flammable environments. Static is most often generated as a byproduct of a person's movement. Example: Clothes rubbing again skin or a person walking on a standard floor. This mat drains the static charge from an individual at a fast yet controlled rate for ultimate static protection in a multitude of environments. It's designed for ergonomic comfort and support. It is not recommended for seated technicians and should be used over hard surface flooring such as standard tiles or concrete. It may also be used to cover thin pile carpet. ElectraStat 180 is a static conductive (not merely antistatic) material for ULTIMATE static decay and ULTIMATE static control. Type 180 features end pieces and center sections that interlock for a runner of ANY length. 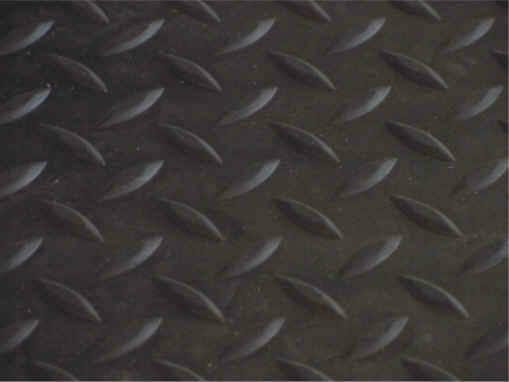 Type 180 is provided with a diamond plate vinyl top surface bonded to memory foam like cushioning layer. ElectraStat 180 is designed to eliminate static generation from standing technicians and easily meets the stringent new S 20.20 standards with electrical resistance properties of<3.5E07 per 97.1 and resistance to ground of < 1 meg ohm (< 1.0E06).